Here’s a screenshot from her email, in fact. So she basically sent me two copies, one to read and one to give away. I’ll have to figure out a good contest before the end of this post……give me a minute, I’ll think of something. 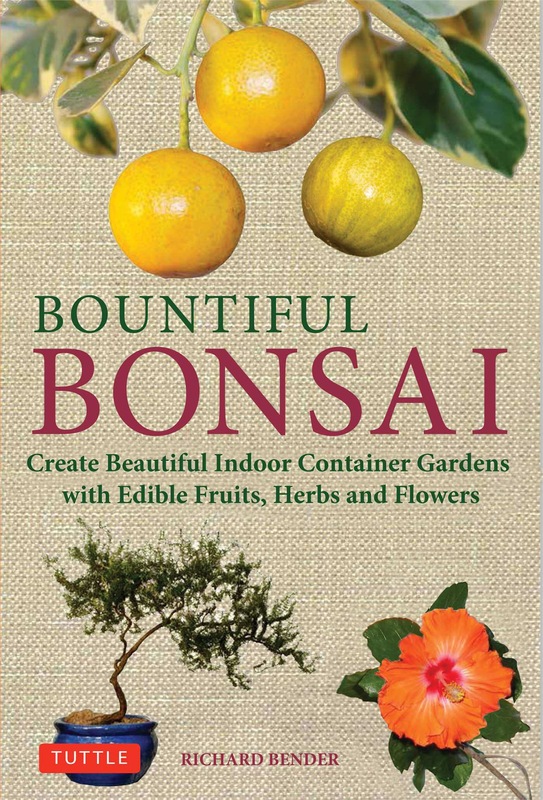 The book was written by Richard W. Bender, who, to quote from the authors bio on the dust cover, is the owner (for over 20 years) of Bonsai by Bender, a wholesale bonsai business in Colorado. And reading the text of the book, he’s been practicing the techniques he outlined in the book just as long. He repeats this just a few times throughout the book. Maybe a bit more than a few. The Look: it’s a pretty book, well laid out with all of the photos in color with well written captions. The feel is smooth and cool, kinda like the flip side of the pillow. One could easily cuddle up with it and drift off to sleep. The Text: the author, Richard W. Bender, has an easily readable style, very conversational and informal. He doesn’t use much in the way of jargon or overly technical terminology to make himself appear more learned. The Information: he knows his stuff. He is the 20 year plus owner of a wholesale Bonsai nursery in Colorado. That’s a long time to be in business in the bonsai world. Time tells, it always does. First, a disclaimer. If you’ve read the blog before, you know that I am a practitioner of outdoor bonsai utilizing near-classical styles or naturalistic styling and I use exaggerated proportions and scale to achieve taper and an aged look to my trees. Mr. Bender, in his quest for crop yield, uses a very non-traditional styling with his trees. This might upset some people. His trees have very little taper, tend to exhibit young looking branching (but ideally spaced for fruiting) and are very tall for their trunk widths. One must remember his goal though: crop yield. He even states that he will leave a branch when it’s artistically awkward because it is full of fruit or flowers. To all this I simply say that art is in the artists eye. In fact, his idea of bonsai brings us back to the original purpose of growing trees in pots. Many texts keep this part of the history of bonsai out of the narrative but, bonsai as horticulture (keeping a tree alive in a pot) started much as the author practices his art. In India, with the traveling medicine men, it was necessary to learn how to keep fresh herbs and trees alive for extended periods, in pots. I’m sure that there were those who started to shape their trees to be pretty (we are all artists after all, it’s human nature). With the spread of Buddhism to China and then Japan you know how bonsai ended up. All of his styling and the “controversy” it might create is small compared to this one little fact: he grows and gets fruit/ crops from his trees in an indoor environment. You read that right: INDOOR. That will definitely infuriate the bonsai establishment. 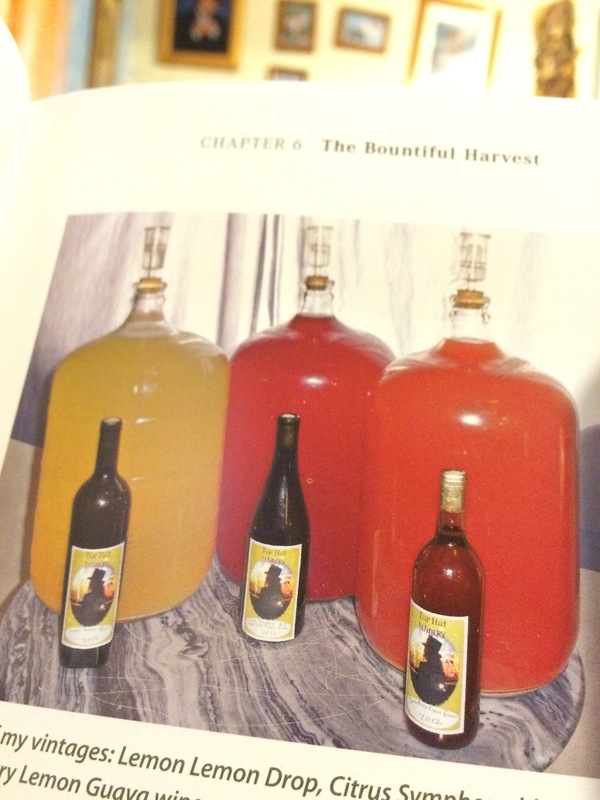 I mean, who can yield enough fruit from a calamodin orange, never mind being grown indoors, to make gallons of wine? Or how about this, this tasty, mouth watering thing? 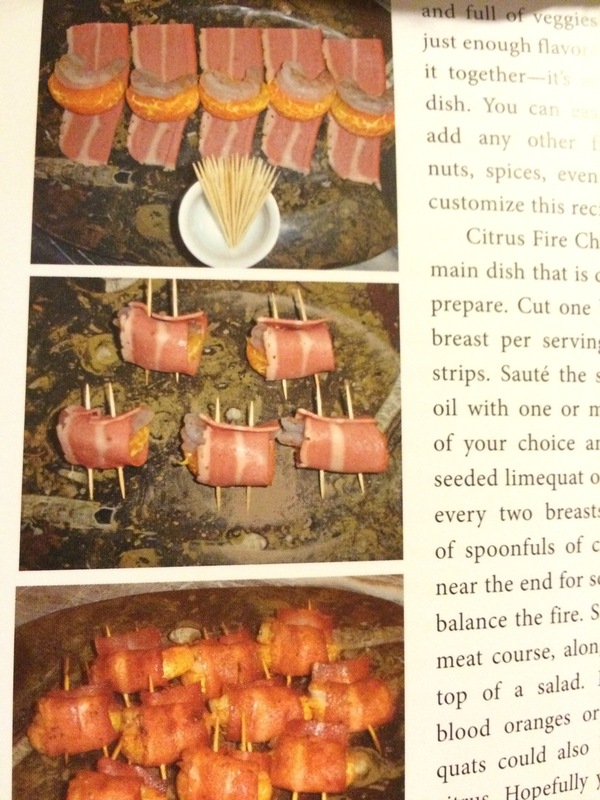 Shrimp, blood orange wedges from a bonsai tree, wrapped in bacon. OMG! He offers some pretty good recipes in the later chapters. I must say, there is something satisfying in eating fruit from your bonsai. I love snacking on the figs that grow on my green island ficus or the silver berries from my elæagnus or even the funny fruit from my podocarpus. Mr. Bender does an adequate job explaining how he grows his trees with indoor lighting and fertilizing requirements (conversationally if not systematically) in the suggested species guide he includes. The book is well laid out for finding info you may be looking for. I would even go so far as to recommend that the serious bonsai enthusiast, even though the aesthetic presented might be contrary to current trends, should have this on their library shelf, if only for reference purposes. I did enjoy the book, it had a refreshing, unapologetic point of view that spoke to my inherent iconoclasm. I don’t really agree with his aesthetic but, who cares. Life is too short to argue with success (remember, he’s had a successful bonsai business for twenty years in Colorado). Before I go I have a legal obligation to fulfill. I must state that I am not receiving any cut from the sales of this book and the only things I’ve gotten from the publishers are the two copies of the book. How’s this sound? The 20th person to send an email to me explaining why the book will benefit them, wins. Send all emails to adamaskwhy@att.net. I’ll add an update when the winner has been chosen. Don’t forget the short essay. I had fun writing this review, I’m hoping it was helpful, but I’m itching to work on some trees soon. So, until then, see you soon! Glad to see you’re writing again. 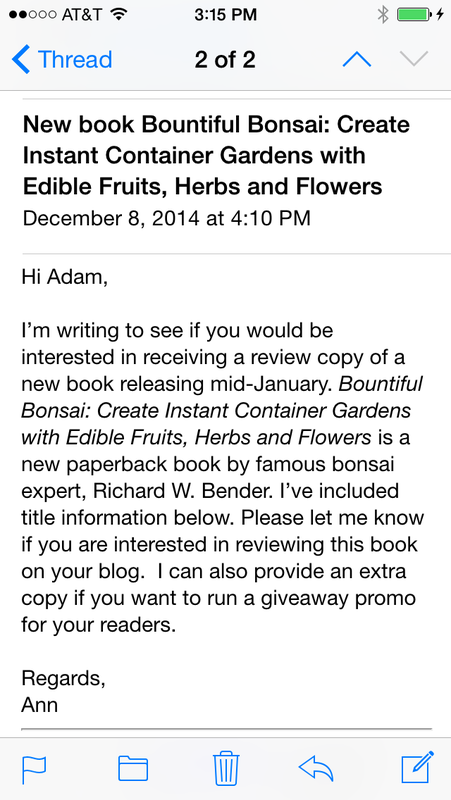 Can’t wait to read about the wonders of permaculture bonsai. It seems like something isn’t working with the post though. unless maybe it’s just my phone. I can’t see anything past the quoted theme. Then the link to the blog doesn’t work. Not complaining, just wanted to point it out in case it’s a setting or something. Hey Adam. Hoping youre healing up good. I been doing herb bonsai for …wow 15 or so years. Rosemary makes absolutely beautiful bonsai trees in a short (5 years) time. Thyme makes perfect little mames you can grow in a pot the size of your finger nail in just a couple years. Myrtle, bay trees, santolina, creeping thyme, lavender, pepper plants, just to name a few all make real cool trees in a short time. I even got a frankincense.